Police in armored vehicles and a helicopter sealed off three neighborhoods of the Saudi capital Sunday in a search for the body of a slain American hostage and Islamic militants involved in his death. American hostage Paul M. Johnson Jr. There was no immediate word on the results of the operation, which began Saturday night and involved dozens of police on the ground and in the air. Any cars that tried to leave the areas were stopped and searched. On Saturday, Adel al-Jubeir, foreign affairs adviser to Crown Prince Abdullah in Washington, said agents were looking for Johnson's body on the northern outskirts of the capital. Saudi security officials, however, said they have been searching desert areas around Riyadh. Houses and apartments also were being searched, they said. Al-Moqrin, reputedly al Qaeda's point man in Saudi Arabia, was killed in a shootout Saturday with security forces a few hours after the terror group posted photographs of Johnson's beheading on an Internet site. Three other militants also died in the gunbattle, which lasted several hours and began when security forces tracked down al-Moqrin and his associates in a car in al-Malaz. 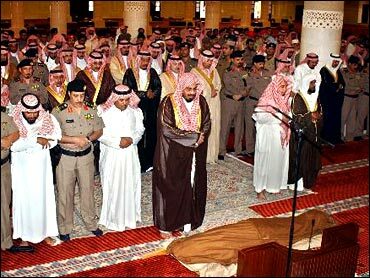 The others killed were identified as Faisal Abdul-Rahman al-Dikheel, Turki bin Fuheid al-Muteiry and Ibrahim bin Abdullah al-Dreiham. Al-Jubeir said al-Dikheel was believed to be the No. 2 al Qaeda militant in Saudi Arabia "working closely and immediately under al-Moqrin." One security officer was killed and two were wounded in the gunbattle, the official Saudi news agency reported. The Interior Ministry said 12 suspected militants also were arrested in a sweep of the capital. They have not been identified, though a Saudi security official told The Associated Press early Saturday that Rakan Mohsin Mohammed al-Saikhan, listed second among Saudi Arabia's 26 most-wanted men, had been wounded and arrested. The English-language Arab News, quoting an unidentified security source, reported Sunday that one of the 12 arrested was suspected of involvement in the 2000 bombing of the USS Cole off the coast of Yemen, which killed 17 U.S. sailors. Saudi TV broadcast pictures of four bloodied bodies it said were the militants, apparently to refute initial denials by Islamic militants that al-Moqrin was dead. Late Saturday, al Qaeda in the Arabian Peninsula, al-Moqrin's group, issued an online statement confirming its leader and the three others had been killed. According to the Saudi news agency, al-Dikheel — also on the kingdom's list of the top 26 wanted militants — was involved in a number of killings and apparently was featured in video footage of Johnson's killing. Al-Muteiry was among the militants to flee the scene of a May 29 shooting and hostage-attack on the oil hub of Khobar that killed 22 people and al-Dreiham was linked to a Nov. 8, 2003, suicide bombing at a Riyadh housing compounds that killed 17, the statement added. The Interior Ministry said authorities had confiscated forged identity papers, $38,000 in Saudi and American currency, three rocket-propelled grenade launchers, hand grenades, automatic rifles and other weapons, the Saudi news agency said. Also confiscated were three cars used by al-Moqrin's cell, including one believed to have been used in the June 6 killing of Irish cameraman Simon Cumbers, who was filming for the British Broadcasting Corp. when he was shot. A BBC correspondent was seriously wounded. Johnson was seized June 12, the same day that Islamic militants shot and killed Kenneth Scroggs of Laconia, New Hampshire, in his garage in Riyadh. Earlier that week, militants in the capital also shot and killed another American, Robert Jacobs of Murphysboro, Illinois. Crown Prince Abdullah, the de facto ruler, and other top officials have described the recent violence as a last gasp of terrorism that has killed scores of people and scared away some of the hundreds of thousands of foreigners who work in this oil-rich nation. Yet many remained skeptical about Saudi Arabia's ability to end terrorism. As many as 35,000 Americans live and work in heavily fortified compounds in Saudi Arabia, reports CBS News Correspondent Joie Chen. Many have stayed for years, and play critical roles in the kingdom's oil industry. U.S. Ambassador James C. Oberwetter praised Saudi security forces for their work, including the killing of al-Moqrin — "among the most vicious of the current al Qaeda thugs on the peninsula" — but said Saudi Arabia remains a dangerous place for Westerners. Al-Jubeir acknowledged there are likely more terror cells in the kingdom besides the one headed by al-Moqrin. Dia'a Rashwan, a Cairo expert on Islamic militants, said Saudi Arabia's conservative Islamic traditions make it fertile ground for extremism. "There are always new generations who can take over and continue their course," he said. Attacks by al-Moqrin, known as a smart and brutal tactician, have shown tactical flexibility — devastating car bombs as well as pinpointed strikes like the kidnapping of Johnson, a first in the kingdom.